About six months ago, I finally invested in the Clarisonic Mia 2 cleansing brush. I had been hesitant to purchase a Clarisonic brush because I do have skin that does not handle change very well. And one of my first free-lance makeup clients was a very real example of what happens when you use the brush incorrectly and too often. She had the worst case of acne I had ever seen and her face had actually improved over what it had looked like in the weeks prior to her appointment with me. After meeting her, I reconsidered my desire to own a Clarisonic brush. But I was at a Women's Expo in Houston this spring and Dillard's had a booth and had a great "show special". I looked at several models, but I chose to purchase the Mia 2 brush because it pulses when it's time to start cleaning a new part of your face. I did have a few little breakouts surface after the first few times I used it, but I do feel like my face is getting cleaner than just using a wash cloth. I use my Clarisonic Mia 2 brush once a day. 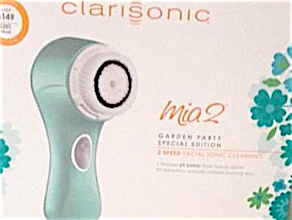 I use the Clarisonic Mia 2 cleansing in the shower. First I use the brush on my décolleté area and when it pulses, I move up to my neck & jawline. Then I clean the cheek area on both sides of my face and the brush manually shuts off. I turn it back on to clean my forehead, and lastly, I proceed down my nose & chin. I thoroughly rinse my face and the brush while giving the top of both of my hands a little cleansing treatment before the brush turns itself off again. Modifying the cleansing procedure this way has made the cleansing process more pleasant. I may still get a few cleansing suds in my nose, but I don't have to be bothered by them during the rest of the cleansing process. I started out using the sensitive skin cleaning brush & then I switched to the normal brush without a problem. If you've wanted to get a Clarisonic, I definitely recommend the Clarisonic Mia 2. With the holidays approaching, you may want to add a Clarisonic brush to your wish list OR to your gift-giving list. The most common mistake she sees with the Clarisonic brush is that people apply too much pressure on the brush. The brush should very lightly glide over the skin. There is no need to "power scour" your face, as you will only damage it. Clean the brush head by allowing it to soak in a little bit of Barbicide between uses.